As some of you may already know, this month is World Watercolor Month. This year the event has teamed up with The Dreaming Zebra Foundation to raise awareness and funds to get art supplies for underprivileged kids. The Dreaming Zebra Foundation is unique in that they provide an art recycling program that is free to the public. Reusable art & music supplies that would otherwise be discarded, along with new or unsold materials are donated by individuals and businesses and matched to recipients who have requested those materials for art education purposes in communities around the world – so you can give then your unwanted art supplies of buy some for them here. I believe that nurturing Art and creativity in children is so important! Amongst many other things, it’s such a great to learn problem solving, basic DIY skills and resourcefulness. 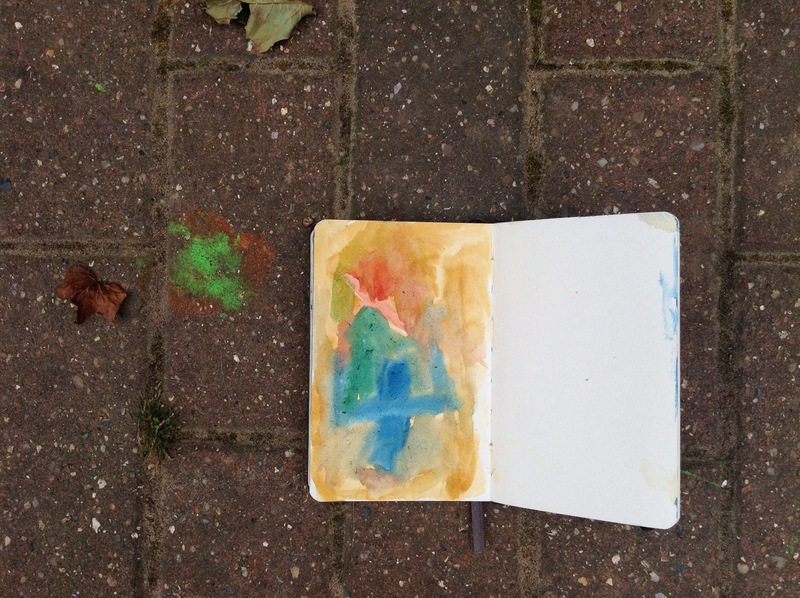 I am always more than happy to share my sketchbooks and watercolour tools with my son and his friends when we are out and about. When Boy has a play with my watercolours while we are out, I have noticed that it’s very different from when I let him have a play with my paints at home. Being outside, waiting, relaxing or on the move makes a big difference. I used to let him use my special magic box back when he was a toddler, thinking that it was much nicer for him to use than toddler paints. I also thought it would make long lasting artwork with beautiful colours… well yes that’s all true. But I had to painfully watch him emptying the half pans contents in water, as he was dipping the brush in water, then covering it in paint and then rinsing it in water again, and repeating until the water in the glass was bright red filled with pigments and my half pan of vermilion was completely empty! It was a good practice for me to not get too uptight about my paints. 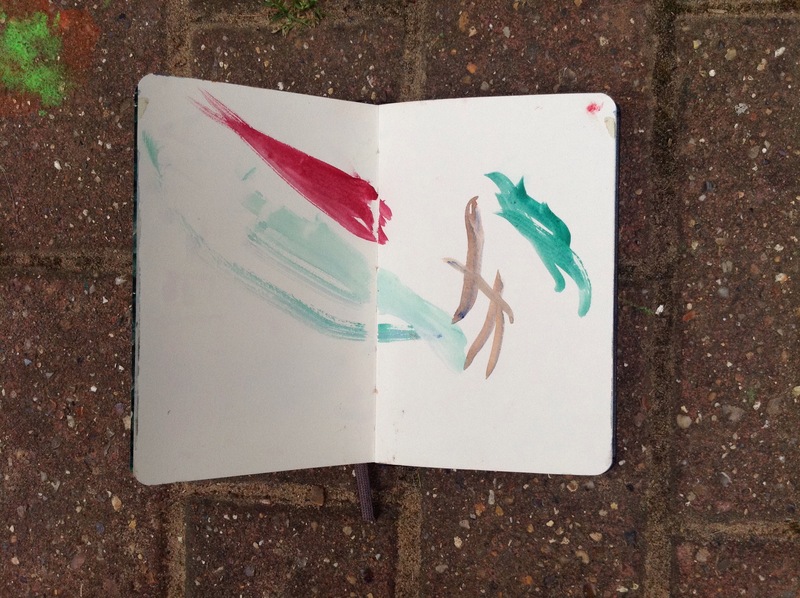 I realised that I tend to use as little of them as possible and to worry about wasting them – to the point where I wouldn’t try certain things or experiment with them just because I thought it would be a waste of such lovely paint or paper. Boy also gave my best brushes a haircut only a few years ago… I came in the living room a couple of years back and I found him standing there, telling me proudly that the brushes hair was getting way too long and badly needed a haircut. When he saw my face he quickly added:”Don’t worry mum, it will grow back quickly”. Santa had to buy me new brushes that Christmas. I did buy him cheap brushes after that, but he never uses them! 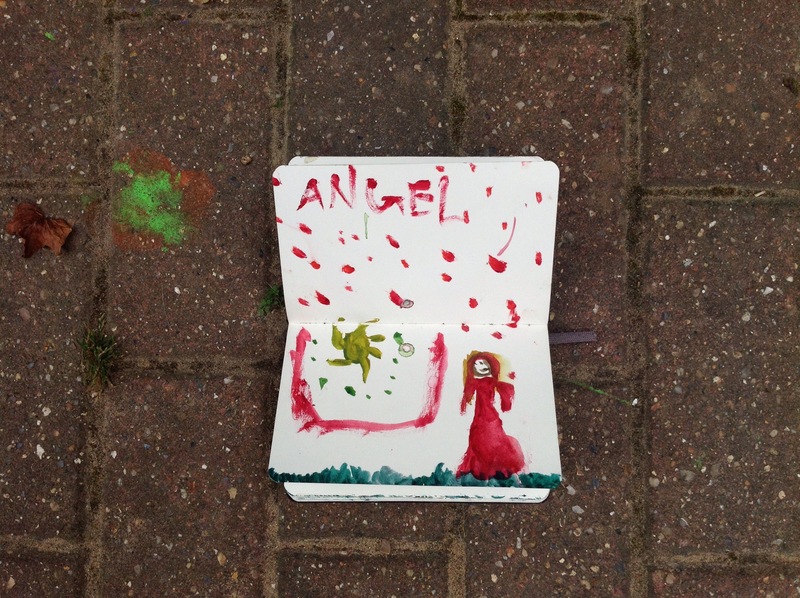 When I’m out and about with Boy I always have my sketchbook, paint box and aquabrush with me and I don’t mind letting him have a play, especially when we are waiting for something… and if his friends are out and about with us, they often ask to have a go when they see me sketching. They can’t help it, but then who could resist the call of watercolour paints, screaming to be played with? Boy painted this double page in my sketchbook yesterday afternoon while he was waiting for me in the car while I was having a dentist appointment. I love the way he mixed the paints and played with the colours! 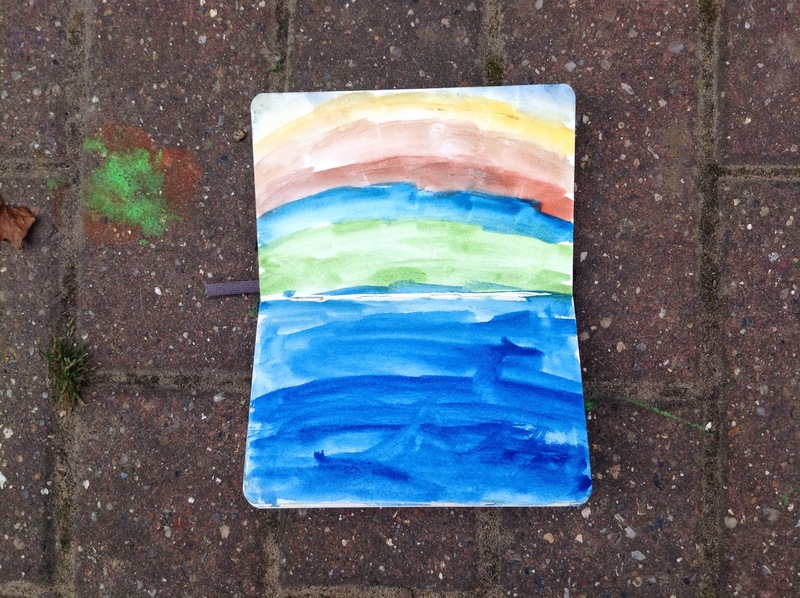 I think that watercolour painting is such a great medium for big and small kids, it’s water based, non toxic, portable, not messy… and great fun! I hope that this post will have conveyed the joy kids can have while playing freely with watercolours. I recognize it as one of Thomas the Tank Engine’s friends but my kids were never into that really so I’m a tad clueless. Gordon? I agree with you about letting kids get stuck into art materials. I’ve found that if I say they are getting to use Mummy’s stuff as a treat then they treat it more reverentially than they do their own kiddie paint (which they get to use unsupervised and solo) so I have no issue letting them get into it – though I’ve not let them use my Kuretake watercolour a yet. I find I’m much for liberated and loose when I create with my kids. We often work side by side. It’s great fun. Art and kids = perfect together!!! This post reminds me of a video I recently watched. It was Neil deGrasse Tyson supporting art education, and I thought it a bit odd that an astrophysicist would tackle the topic. Turns out he said just what you did about art building kids’ problem solving skills to help them in all aspects of life, and that once we stop supporting art, we stop being an advanced society. Go art!! Especially these days when it seems too many people just spout whatever sound bite they most recently heard! 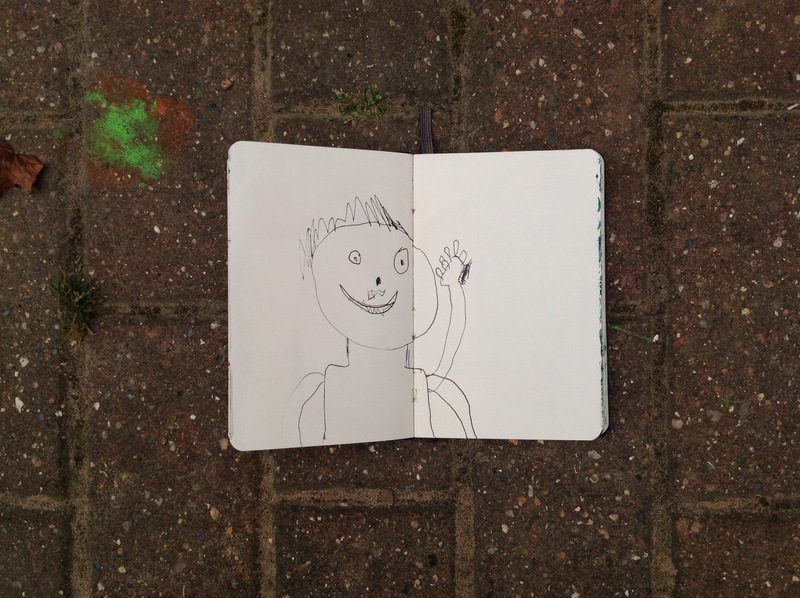 Oh, I so enjoyed seeing the watercolours Boy and his friends have created! It’s great that they get a chance to experiment with your art materials, and that they use them with such gusto. I used to get the same feeling on the rare occasions I was allowed to use my mum’s super-sharp fabric scissors for craft projects! 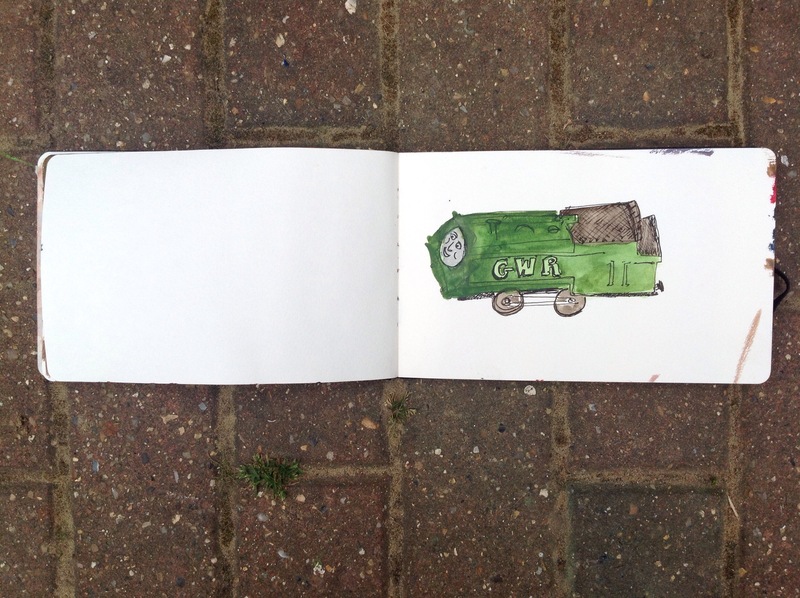 And I’ve been racking my brains trying to remember the name of that train – is it Percy or Duck, maybe?